Editor’s Note: The Winter 2019 Newsletter has been out for only two hours and we need to make a correction. The Bishop Museum did go forward with their exhibition Kini Ke Kua: Transformative Images with the following description: Honolulu, Hawaiʻi – In less than a month, Bernice Pauahi Bishop Museum will showcase its newest original exhibit, which will explore the relationships between kiʻi (images) and people. “Kini ke Kua: Transformative Images” will invite guests to engage with rare and treasured objects from the museum’s collections and from around the Pacific, in addition to new works from a contemporary indigenous artist specially commissioned for “Kini ke Kua.” This multifaceted presentation will encourage guests to carve their own paths in relationship to these revered objects and art forms. The exhibit will be on display in the Joseph M. Long Gallery from Feb. 16–Sept. 2, 2019. Ki‘i, which refers to images in the Hawaiian language, are a cornerstone of Hawaiian spirituality and can take many forms. Fashioned from wood, stone and other natural materials, ki‘i become embodiments of deity: representations of akua (gods) and ʻaumākua (personal or family guardians). This exhibit will explore some of the ways in which relationships between kiʻi and people may change over time, how some of those changes have occurred, and to what extent such transformations shaped and reshaped images in different times and contexts. At the center of this exhibition will be a kiʻi gifted to Bishop Museum by Marc and Lynne Benioff in March of 2018. The wooden image will serve as the focal point of the exhibit, and will contribute to the larger dialogue about relationships, spirituality and kiʻi in Hawaiʻi and as they move through the world. 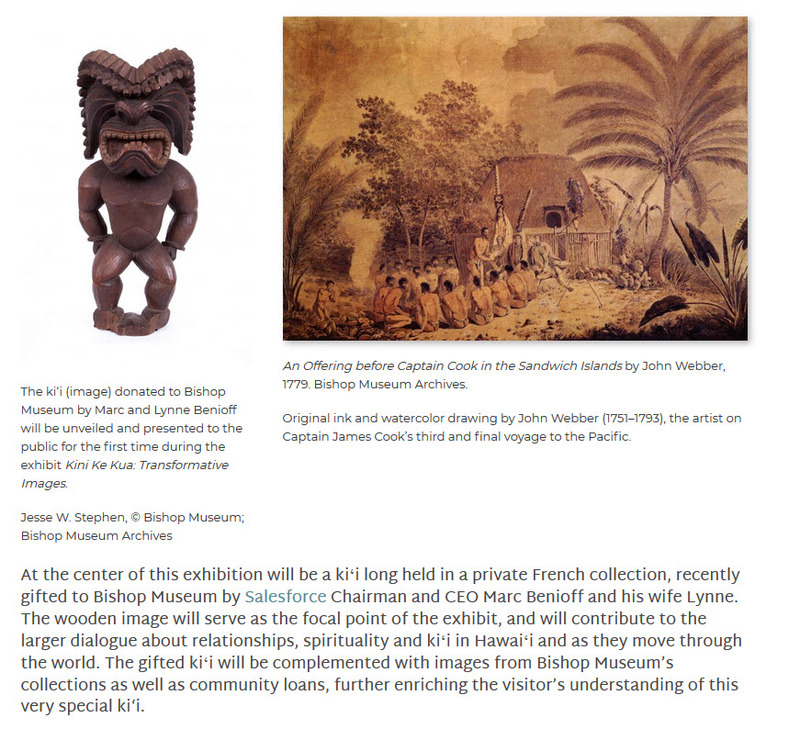 The gifted kiʻi will be presented in conversation with rarely-seen historical collections from Bishop Museum. Included in the exhibit will be an original ink and watercolor drawing from Bishop Museum’s Archives by John Webber (1751–1793), the artist on Captain James Cook’s third and final voyage to the Pacific. An Offering before Captain Cook in the Sandwich Islands, which was later made into engravings and widely distributed in published accounts of the voyage, is one of the first two-dimensional representations of kiʻi. To further enrich the visitor’s understanding of these images through contemporary indigenous lenses, Bishop Museum invited the Hawaiian carving collective Kūpāʻaikeʻe and the renowned Māori artist Lyonel Grant (of the Ngāti Pikiao and Te Arawa tribes) to present works never previously displayed in a museum setting, and tying present, past and future makers and image shapers together. Looking at the practice of carving and the newly acquired ki‘i through other media, the Hawaiian visual artist, musician and genealogist Douglas Poʻoloa Tolentino was also commissioned by the museum to create four pieces inspired by the collections that explore the relationships between ki‘i and kanaka (people). The title is fascinating in that it implies a desired dialogue between objects of the past and contemporary objects that will be featured in the exhibition. In the press release there is not apparent effort to identify the Christies piece as either made for traditional use or dating to the 18th or early 19th century. Maybe this is considered to be the best option to deal with international critics that commented to date on Christies failure to follow basic protocol in vetting the piece. It is a fascinating dilemma that may just fade away; however, eventually the Bishop will need to address Adrienne Kaeppler’s very direct statement quoted by the New York Times as “I told them it looked like a similar replica of the sculpture in the British Museum, only smaller,” Dr. Kaeppler said. “I was concerned that its history only went back to the 1930s.” I told them that it looked like a similar replica is for anyone in the field a death sentence for any object.. especially when it comes from Adrienne Kaeppler, the highly regarded scholar/curator from the Smithsonian.